Provide comfort for the family of Kija Bolton with a meaningful gesture of sympathy. 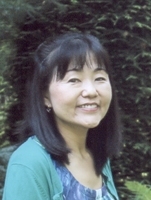 Kija Kim Bolton, of Williamstown, MA died of cancer on March 9, 2019 at the age of 52. She was born on July 4, 1966 in Osaka, Japan, to Korean Japanese parents Kenji and Takako Matsui. She attended Tennoji High School and graduated from Osaka's Kansai Foreign Language University in 1989. In 1991, she came to the United States to attend graduate school, receiving a Master's degree in Teaching English as a Second Language from San Francisco State University in 1994. She married Christopher Bolton in 1996. Kija worked as a special education teacher in Riverside, California and North Adams, most recently at Brayton Elementary School. She was known for her kind, cheerful manner, her sense of humor, her deep love of teaching, and her indomitable energy and spirit. She is survived by her parents, her brother Toshinori Matsui, her sister Yoko Miyata, her husband Christopher, her two daughters Mariko and Erika, her father and mother in law, Roger and Julia Bolton and nieces and nephews. FUNERAL NOTICE: Calling hours for Kija Bolton will be Friday March 15, 2019 from 4-7 PM at FLYNN & DAGNOLI-MONTAGNA HOME FOR FUNERALS WEST CHAPELS, 521 West Main St. North Adams, MA. Services will be Saturday March 16, 2019 at 11:00 AM at St. John's Episcopal Church, Williamstown. Burial will be in the spring. In lieu of flowers, memorial donations may be made to Brayton Elementary School in care of the funeral home. To add to the Book of Memories, please visit www.flynndagnolifuneralhomes.com. To send flowers in memory of Kija Kim Bolton, please visit our Heartfelt Sympathies Store. We encourage you to share your most beloved memories of Kija here, so that the family and other loved ones can always see it. You can upload cherished photographs, or share your favorite stories, and can even comment on those shared by others. Provide comfort for the family of Kija Kim Bolton by sending flowers.